The EFL SMARTblog: Could you live without it? What are the essential things in your life? What couldn't you live without? Could you live in a world without computers, cars, TV, mobile phones, electricity...? You are going to read an article about someone who has lived for 29 years without electricity. How do you think he manages to live without electricity? How does he cook, heat the house and see in the dark? Read the text and find out. John faces his 29th Christmas without electricity. Two years ago, he successfully campaigned to have electricity installed along his road. 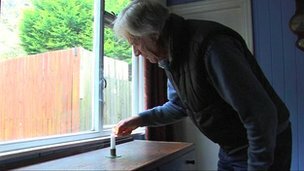 But while his neighbours are enjoying their kettles, lights, washing machines and fridges, 77-year-old John McCarter is still waiting to be hooked up.The home that he's lived in since 1983 on the Seacoast Road at Downhill, close to Coleraine, is still being heated by two open coal fires, with candles providing his only light. John lives in an idyllic setting, with his home nestled under the cliffs looking out to sea, but his living conditions are far from perfect: "During the summer, brilliant. Except for the fact you haven't got a thing like a fridge, which I can live with." "However, when the winter comes and the temperature drops down to minus four degrees and you get out of bed in the morning, and even before you get out, you can see your breath hanging on the air - it's far from pleasant," he said. "The cooking isn't a problem, because I've got a gas cooker and that satisfies that end, but lighting is one candle and one tealight. "The candle provides the general lighting, the tealight lights up the face of the clock to let me see as the minutes tick away. "I have two open fires, one in the sitting room and one in the living room. "They're adequate provided they are burning, but the problem is you can't stay up all night to keep them alight so I usually stoke them up about 11.30pm before I go to bed, but by 3am, in the morning they're out and then the temperature just plummets. "By the time you are thinking of getting out of bed at 8am, the temperature inside is the same as outside." Could you live like John? Could you live without your mobile phone, smartphone, blackberry or computer? Why / Why not? Are you addicted to them? / Do you know anyone who is addicted? What do you use your mobile phone for? Make a list of all the things you can do with it. 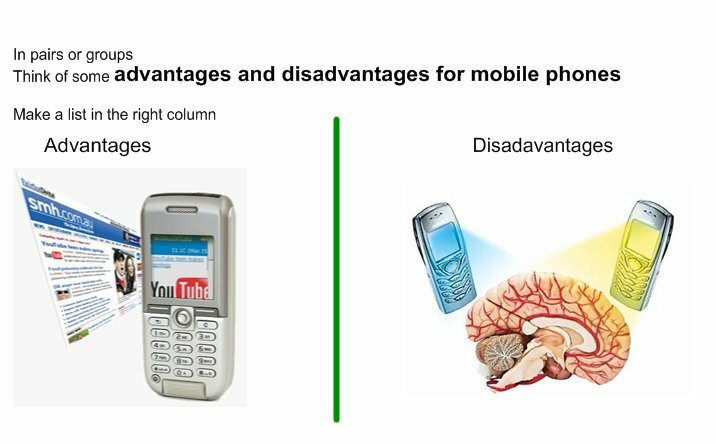 Do you know how mobile phones can affect your health? 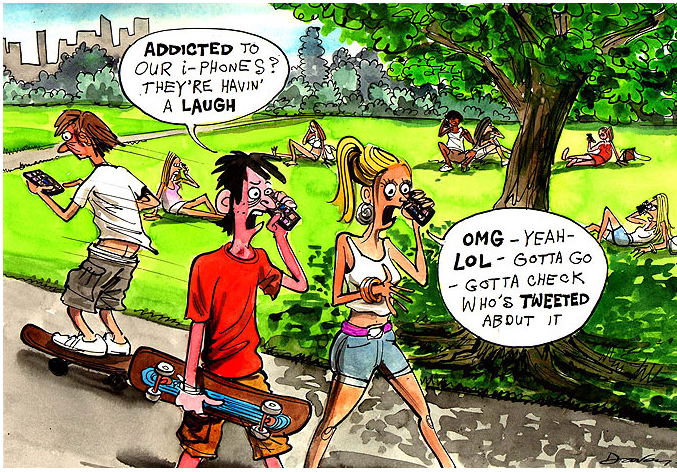 Do you think that mobile phones are sometimes anti-social? Why / why not? Look at the words below. Which describe how you feel about your phone? Can you think of any more? 4a) Now watch this clip. What answers to questions 2, 4, 5 and 6 do people in the video give? What is the video maker's opinion of mobile phones? Add some ideas of your own and make a list of good things and bad things / advantages and disadvantages of mobile phones or smartphones. "Mobile phones; Friend or Foe?" What are you going to say in the conclusion? Sum up your ideas in 1 or 2 sentences. Give an opinion. Don’t introduce any new ideas. 1) What words or expressions can you use to introduce ideas? 2) What words or expressions can you use to continue, explain or contrast your ideas? 3) What words or expressions can you use to finish or conclude your ideas? Write the essay - check! then you have not finished or answered the question properly! Are mobile phones safe for our children to use? - Do you know how mobile phones affect your health? - texting can damage your eyes, rumours, not really "clued up", not quite sure, more dangerous than smoking but no evidence to back this up.